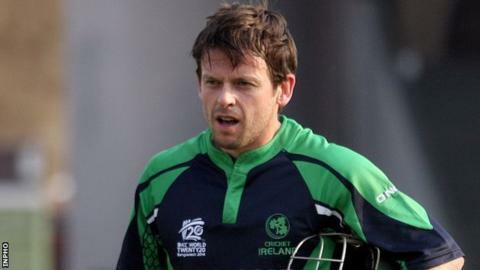 Batsman Ed Joyce believes Ireland will never have a better chance of toppling world champions Sri Lanka than when the sides meet at Clontarf next month. Joyce is named in a 13-man squad for the matches in Dublin on 6 and 8 May. "I'm convinced we have a real chance of beating Sri Lanka as they won't relish the conditions we're likely to face in early May in Dublin," he said. "As a player you want to test yourself against the best and Sri Lanka certainly come into that category." Joyce has been in sparkling form, scoring three first-class centuries this month, including two in the recent victory at Edgbaston which helped Sussex to the top of the County Championship. The 35-year-old scored his first Ireland one-day international century against Pakistan in 2013 but ended up on the losing side after an epic two-match series. "We tied with Pakistan at the same venue last year, and lost the second match by a narrow margin when we looked like winning it," said Joyce. "It was a very special occasion for me to score that hundred in front of a sell-out crowd but it was a bitter-sweet experience as we eventually lost that game. Hopefully this time we can go one better and record our first Dublin victory against one of the big teams. "I've only played one international match against Sri Lanka during the 2007 World Cup, so I'm really looking forward to the challenge of facing some of the world's best bowlers." Ireland coach Phil Simmons and his fellow selectors have gone for the tried and trusted, with all 13 players named featuring in the recent ICC World Twenty20 tournament in Bangladesh. "We've resisted the temptation to make any changes, as the guys have been magnificent over the past few years," Simmons explained. "We've turned in some fantastic performances against Full Members in recent times, but it's a reality that we still haven't recorded a major victory here in Dublin - although we seem to be getting closer every year. "What better way to break that duck than with a win over reigning world champions? That would be a great thank-you present to the Irish fans who have made our last two fixtures sell-outs." Simmons is encouraged by the early season form of his players. "It's great that the skipper William Porterfield has been amongst the runs, making 77 against Lancashire, and of course Ed Joyce has been just phenomenal for Sussex," he said. "Tim Murtagh has been among the wickets for Middlesex while George Dockrell had a five-wicket haul in a Somerset seconds game, so that will give them all encouragement as we look for that landmark win." Ireland squad: William Porterfield (captain) (Warwickshire), Alex Cusack (Clontarf), George Dockrell (Somerset), Ed Joyce (Sussex), Tim Murtagh (Middlesex), Andrew McBrine (Donemana), Kevin O'Brien (Railway Union), Niall O'Brien (Leicestershire), Andrew Poynter (Clontarf), Max Sorensen (The Hills), Paul Stirling (Middlesex), Stuart Thompson (Eglinton), Gary Wilson (Surrey).